I had such fun pulling together the 12 chocolate cupcake recipes post last week (research, right?) that I decided to round up another dozen incredible looking cookie recipes in these fleeting days of October (which, apparently, is Cookie Month). Whoever is making up these holidays, I love you! I'm super excited to try all of these recipes -- perfect for fall/winter baking inspiration! Which recipe will you try first? 1. 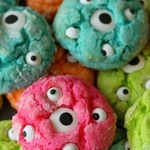 Perfect for Halloween and no complicated piping required: gooey monster cookies. 2. For the vegans: oatmeal raisin spice vegan cookie cream sandwiches. 3. For those who require/prefer gluten-free: flourless brownie cookies. 4. I love sweets stuffed inside of sweets: caramel stuffed pumpkin cookies. 5. Did I already say I love sweets stuffed inside of sweets? Salted caramel stuffed chocolate crinkle cookies. OMG. 6. Simple and easy melt in your mouth goodness: melting moments cookies. 7. Cookies gone romantic: red velvet cookies with cream cheese filling. 8. I have no idea why turtle cookies are called turtle cookies but I’m so glad they exist. 9. The most cheerful and psychadelic cookies in the history of the universe. 10. For those who don’t want to fire up the oven (and hey, there’s fiber here too! ): coconut date no-bake cookies. 11. I’m a sucker for deliciously soft lemon cookies. 12. For mint lovers: ultimate grasshopper cookies.